From the left: Carl-Erik Kihlman, Pär “Pippi” Willén, Johnny Durgin, Åsa Kinnemar and host Lelle Olsson. Behind the camera: Birgitta Blakstad Poolsaar. 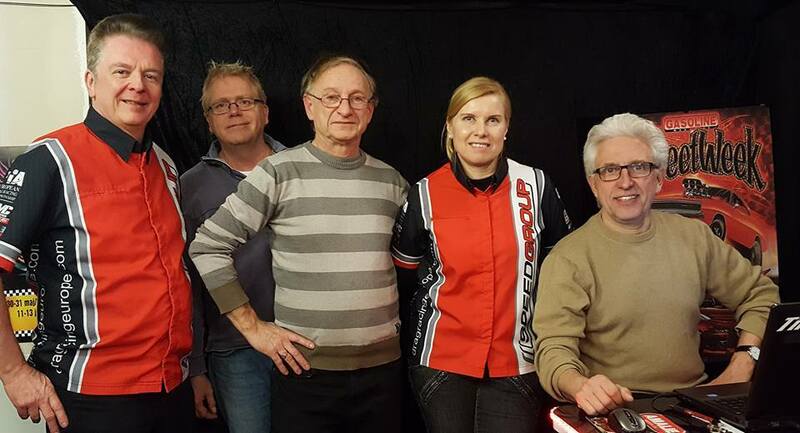 On Wednesday March 8th Speedgroup visited Motorsoffan #193 web-TV show. Broadcasted from the Nitroz studio in the South part of Stockholm, Sweden. Work Group member Carl-Erik Kihlman, CEO Åsa Kinnemar and contingency program co-ordinator Birgitta Blakstad Poolsaar took part and shared information and news from the operation, Series and Championships. The web-TV show replays at http://nitroz.se select webb-TV in the menu. Welcome to watch us! PS. It is possible to select the English sub title version for non-Swedish speaking viewers.